Metabolic workouts are the only sort of cardio I enjoy (ok…I do like sprints as well). I hate long distance running or any steady-state cardio for that matter. But they are a version of cardio that I love. And I don’t just love them because I feel utterly destroyed after each one. Because, in fact, I don’t. Not every metabolic workout should smash you. While workouts like the 20/20/20 are great and even essential to your workout routine, so are metabolic workouts where you never redline, where you never feel completely smashed. It is like the difference between sprints and a long jog. After sprints you may feel exhausted because each one is an all out effort and you need to rest in between. Whereas with the jog, you should feel like you can keep going at the same pace the entire time because you never give an all out effort. 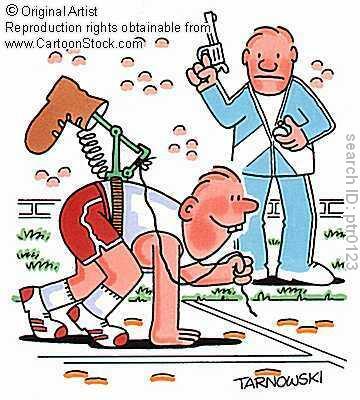 Some metabolic workouts need to be like that. Some metabolic workouts should have you working at 70% of your max output instead of going all out. Below is a great aerobic metabolic workout. Make sure during it that you never redline. You want to keep moving at about 70% of your maximal output for the entire time. Set a timer for 10 minutes. Work at 70% and keep moving the entire 10 minutes. Rest a couple of minutes between circuits. This is a great workout to do with a friend or two. For more metabolic workouts, check out the Workout Library. What are some of your favorite cardio workouts? I’ve said before I hate cardio…But that really isn’t completely true. I just hate long, slow cardio. SO BORING. And it also kind of makes me mad that everyone thinks that they either need to go for a jog or hop on a piece of cardio equipment to get their cardio in. You can easily do a super tough and fat burning cardio workout at home with very little space! 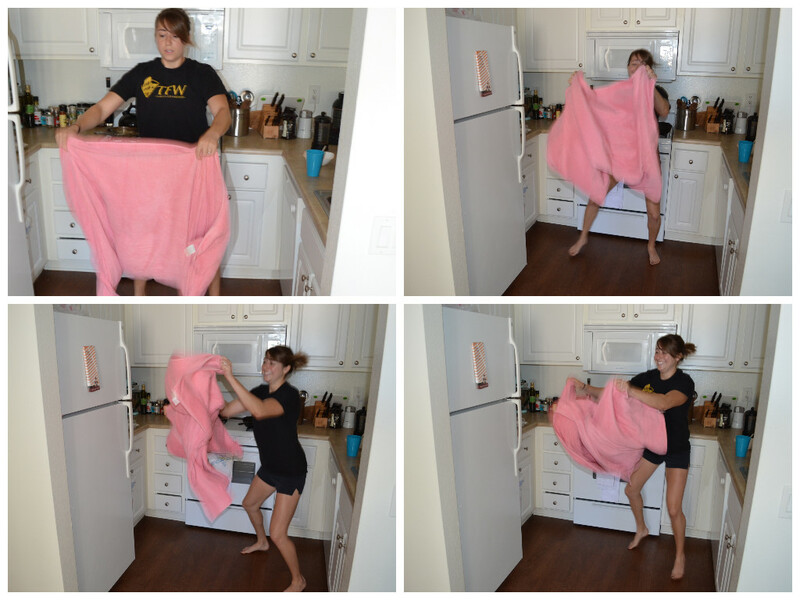 For example you can do the towel taz…. The other day I actually did one a great at home cardio workout although I didn’t do the towel taz. I didn’t feel like going in to the gym, but I wanted to workout. I also didn’t feel like doing a long workout since I had a lot to do. AND on top of those things, I didn’t have a lot of space to work with and had to do it outside the kitchen since Ryan was holed up in the office doing work. Stretch and roll out anything that is tight when done. Now this is cardio I like. What’s your favorite home cardio workout? So usually when I talk about cardio, it is to rant against it. I HATE long, steady-state cardio. I do however, really really like sprints. And tabata training falls within the sprint category. Tabata training is essentially performing as many reps of an exercise as you can for 20 seconds. This can be running, jumping, squatting…anything. After 20 seconds of work, you get 10 seconds of rest. You repeat this process 8 times. The whole set of 8 rounds is 4 minutes. But boy is it a deadly four minutes. I swear 20 seconds has never felt so long or 10 seconds so short! In that 20 seconds you work as hard as you can – you give 100% effort. And in the 10 seconds that follow, you barely recover before your right back to work. 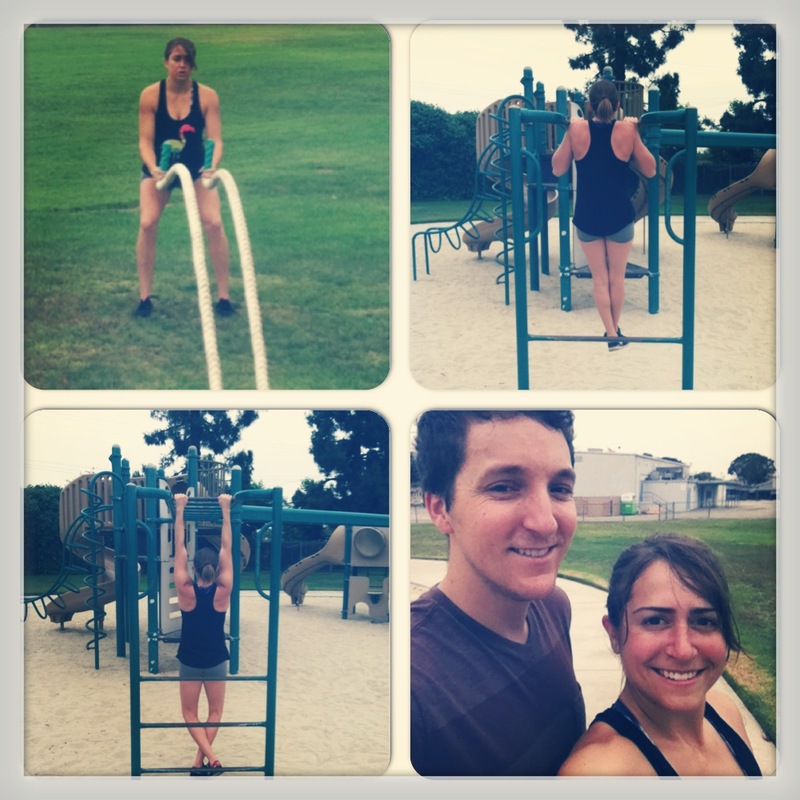 Yesterday, Candy and I did a squat jump and burpee mixed tabata. We alternated exercises each round and trust me…our legs and lungs burned. The first round of squat jumps, you feel the burn but you bust out about 1 per second. Then you go into burpees and your legs feel like jello. The 10 seconds of rest feels like nothing when you start jump squats again. Your legs burn after three and the 20 you did the first time seems like an impossible number to reach. But you push on, trying to complete as many reps as you can in that 20 second. And you keep pushing – through all 8 rounds. After the 8 rounds, we did two minutes of jump rope and then repeated the four minutes of burpee-squat jump hell before two more minutes of jump rope. That’s all it took to make our legs and lungs feel like we’d done cardio for an hour…12 minutes. Of course the push up/pull up pyramid we completed before definitely didn’t make us feel any better…but even if we hadn’t…that 12 minutes would have been enough! And the thing is, you don’t even need 12 minutes to get in plenty of cardio. You just need 4. On Tuesday after a heavy leg workout, Candy and I did tabata sprints. We jacked the speed up to 10.5 (which isn’t our fastest but give us a break it was after legs!). We jumped on and sprinted for 20 seconds. The first one wasn’t fun, but it felt doable. We jumped off to the sides and rested for 10 seconds. The second one was ok, but you could tell the last few were going to be a struggle. After 8 rounds, I was wiped out. Four minutes of sprints…that was all it took to give me a great cardio workout. So why are you wasting 60 minutes on a treadmill when you can get great results just doing 4? You save time by doing tabata workouts. You’ll burn more fat. And unlike long, steady-state cardio, you will not only improve your aerobic system, but also your anaerobic system. 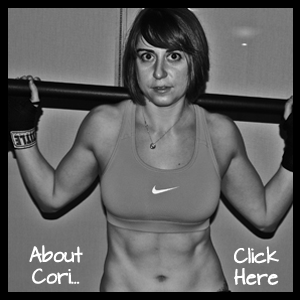 I thought this was a great site for more information on Tabata training! Try it!! I guarantee you’ll get a great workout!